- copies: the number of copies of the following docs varies according to the number of pieces on the sheet and the number of children. Only 1 cross per child is needed. Use brown paper. The pattern doc has 10 crosses on it. 2. 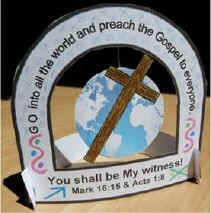 Go into all the World Craft – Arch & Stand (Go into All the World Craft Arch & Stand.doc) One sheet for each child. Use heavy paper and follow Directions A! If you cannot get heavy paper for copies make 2 copies of the Arch & Stand doc for each child and follow Directions B! 3. Go into all the World Craft – Globes (Go into All the World Globes.doc). Color copies - glossy or picture paper is nice but heavier copy paper also works. Each child needs both sides of the globe. There are four sets on the pattern doc. OR each child needs one side of the globe and one side of the globe with the missionary. Our picture on a globe is included on the Go into All the World Globe Missionary.doc. The missionary picture can be changed if you would like. 1. Cut out all pieces. 2. Color and decorate the arch and stand. 3. Make a loop and tape 1 inch of thread to the backside of the globe at the north pole (the thread should extend upwards). 4. Glue the reverse side of the globe (or the missionary picture globe) to the front globe making sure that the sides are matched, right sides up. 5. Glue cross diagonally onto the front side of the globe. 6. Lay the arch face down in order to position the globe with the cross so that it will turn freely. 7. Make a loop with the rest of the thread and tape it to the center of the backside of the arch and put a sticker over the thread. 8. Cut two slot lines on the bottom left and right sides of the arch and stand. 9. Insert the arch slots into the stand slots. 7. Make a loop with the rest of the thread and tape it to the center of the backside of the arch and glue the other arch on top. 8. Glue stand together back to back. 9. Cut two slot lines on the bottom left and right sides of the arch and stand. 10. Insert the arch slots into the stand slots. "Becky and I plan craft projects that help children remember the Bible message. Time invested and enjoyed while making an interesting craft related to the Word they have heard makes it meaningful for years. Experience has shown us that our craft projects help children take God’s Word to heart and are an encouragement for children to follow Christ faithfully. Our second ministry priority is Evangelism in Ebenthal, Austria. We live in Ebenthal which borders on Klagenfurt, the provincial capitol of Carinthia. Becky and I are very thankful for everyone who wants to partner with us in our ministries for Christ." You have permission to copy this craft for personal / local church use but only with this copyright notice and not for commercial publication. You can donate to our ministry using marknbecky@aon.at on PayPal.